Welcome to the post-New Years cinematic dearth, when many people are looking for a convenient way to relieve stress, no doubt after having been subjected to WAY too much ‘family time.’ It is in this social climate that the therapeutic powers of Ruben Fleischer’s Gangster Squad may be welcomed with open arms. Featuring the considerable talents of Josh Brolin, Ryan Gosling, Emma Stone, and Sean Penn, Gangster Squad, in many ways, was already sure of its success before filming ever began. By that, I mean I’m almost certain that more attention was deliberately given to action sequences than to character development, and Fleischer knew that we would still go see the movie anyway. And indeed, there is something undeniably cathartic about watching Josh Brolin (who is apparently an absolute bear of a man) as Sgt. John O’Mara beat the ever-loving stupid out of various flavors of thug with his bare (bear) hands. Likewise, the sight of Ryan Gosling in a three piece suit holding a shotgun might make many people, including myself, weak at the knees, but I simultaneously can’t help but feel that there’s a kind of underlying hollowness to it all. Set in a beautifully stylized depiction of 1940’s Los Angeles, Gangster Squad incorporates outstanding density and attention to detail to create a surprisingly immersive experience. Expertly paced, action sequences are nicely varied with character building, and the soundtrack was filled with all the 1940‘s splendor that you could ask for. You could’t help but smile as lovable, semi-crooked cop Sgt. Jerry Wooters (Gosling) put the moves on Cohen’s main squeeze, Grace Faraday (Stone). Then, unfortunately, you frown again as their relationship drifts towards the arbitrary and what was supposed to be a powerful moment passes by, almost without emotionally registering. Inconsistencies in plot can generally be overlooked, although some niggling doubts remain. For example, why is it established early on that Jack O’Mara (Brolin) is supposed to be an expert in guerrilla warfare while he consistently attempts foolhardy, not to mention suicidal, frontal assaults on formidably armed enemy hideouts? In reality, Wooters seems to be the real brains of the operation while everyone else is along for the ride. Thematically unchallenging, the essential conflict revolves around the fight between good versus evil, with only vague stabs in the direction of more complex subjects, such as the ethics behind it all. An interesting rift between O’Mara and his wife is ripe for development, involving his professional duty versus his familial duty, but in the end nothing really comes of it. Gangster Squad uses the plot device that I will henceforth refer to as “fellowship-of-the-ring syndrome,” the employment of which involves the assemblage of a team of various ‘specialists’ to help combat some otherwise unstoppable evil. This time around, that evil comes in the form of MIckey Cohen (Penn) and his rapidly expanding criminal empire. The problem often times with the use of fellowship-of-the-ring syndrome is that the introduction of so many central characters naturally means less thorough characterization for each. I got out a kick out of the inclusion of the blatantly token Latino character who quite literally is included into the ‘gangster squad’ because no one knows what else to do with him, as well as the only slightly less token black character, both of whom were presumably included merely to represent a nice spectrum of diversity. My real problem, strangely enough, was with the characterization of Cohen. I heard another critic refer to his character as more of a Batman villain rather than an actual person, and I wholeheartedly agree. Penn no doubt did the best he could with the material he was given, but I was nevertheless disappointed because he was forced to play a caricature rather than a character, and his talent was squandered, as fans of Milk, Carlito’s Way, or Dead Man Walking can attest. 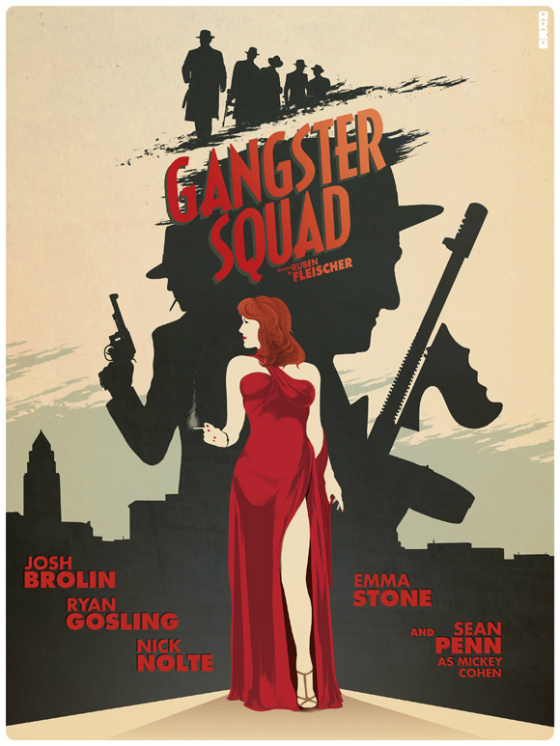 In the end, Gangster Squad is a fast paced, visceral celebration of boyish, fantasy gangster-violence. Overall it works, considering what it’s actually trying to accomplish and I certainly enjoyed watching beautiful people fight to save what they loved amid a beautiful backdrop. Characterization leaves something to be desired, but the action compensates, as it should. Director Ruben Fleischer won some good will with Zombieland (2009) and almost immediately lost it again with 30 Minutes or Less (2011). Fleischer probably has a long career in front of him and, come what may, I look forward to seeing more of his work. I say remain cautiously optimistic for the future. Note: As you may or may not be aware, after the Aurora massacre, a scene in the film was cut depicting the ‘gangster squad’ shooting up a movie theater. The ethics behind this choice are interesting, and there’s really no right answer as to whether or not it should have remained. We’d love to hear your comments on the subject.